Our small cottages are well equipped for self-catering, with stove, refrigerator, hot and cold water. The cottages are also adapted for winter use, and the space inside is 16 m². Bed linen and towels are not included in the price, but are available for hire. Our bigger cottages offers 48 m² living-space, with two bedrooms (one with double-bed and the other with 2 Twin Bunks), living-room, fully equipped kitchen, bathroom with shower and water closet. Fireplace during off season. Each cottage also has a separate store house for fishing equipment etc. and a private porch with garden furnitures. 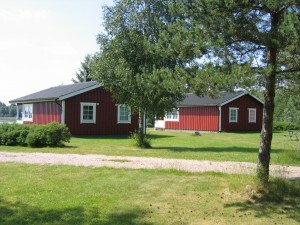 The cottages are partly adjusted for disableds, are situated 25 m from Lake Bolmen and are also suitable for winter use.